The first few years of a child’s life set the foundation for a lifetime of health and well-being. And in D.C., home health visits are ensuring that low-income children have the same opportunities as their peers. WASHINGTON — The first few years of a child’s life set the foundation for a lifetime of health and well-being — it’s when the brain develops at a rapid rate; when health and nutrition habits are formed; and when social and emotional connections are fostered. And for low-income children, the early years are especially critical. Research shows children living near or below poverty have poorer health outcomes than their peers, including higher rates of asthma, obesity and injuries. They’re also more likely to endure emotional, behavioral and cognitive issues. But since 2010, public health experts have worked to make sure low-income children have the same early opportunities as others — and it all starts with a home visit. “Evidence-based home visiting helps children and families get off to a better, healthier start,” said Cindy Phillips, acting director of the Division of Home Visiting and Early Childhood Systems at the Health Resources and Services Administration’s Maternal and Child Health Bureau. 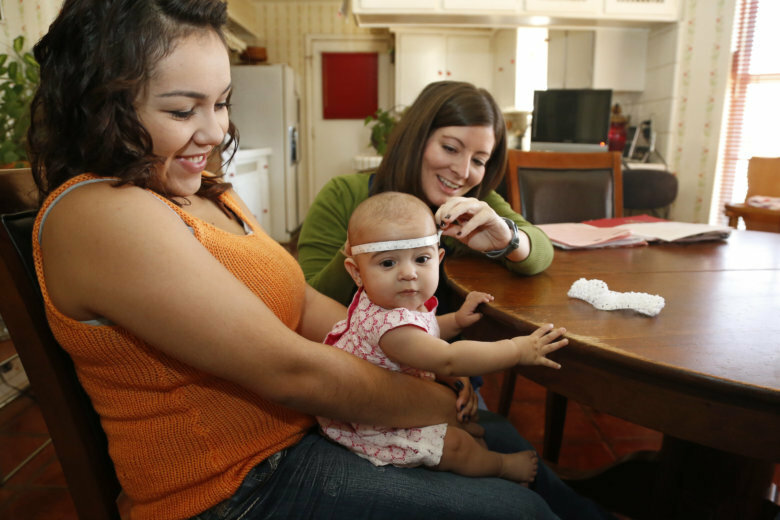 Since 2010, the Maternal, Infant and Early Childhood Home Visiting (MIECHV) program has awarded money ($361 million in 2018 alone) to states and territories to implement home visiting programs for at-risk families. D.C. was just awarded $1.8 million (up from $1.6 in 2017) to support home visits from nurses, social workers and early childhood educators, to at-risk pregnant women and families in the nation’s capital. “They’re teaching parents about the importance of early language and literacy activities; they’re providing information and guidance on health care needs, such as breast-feeding and nutrition,” said Phillips when describing what happens at these home visits. The visiting nurses and social workers also conduct screenings for development delays and provide referrals for parents struggling with substance abuse. In 2017, D.C.’s MIECHV program served 497 participants in 215 households through a total of 2,625 home visits. Phillips points to data to show the impact the program has had on children in the District. Ninety-two percent were screened for developmental delays (compared to 69 percent enrolled in the program, nationally, and 30 percent of all children, overall), and 85 percent of babies were always placed on their backs for safe sleep. “It’s really addressing many needs of the family, from economic self-sufficiency to addressing parenting skills and getting necessary services for children and their families,” Phillips said. Maryland received $7,925,829 in funding for the program this year; Virginia received $7,860,627.